I have a fondness for things that have withstood the test of time–like Farmer John’s grain mill. Manufactured in the 1940s and having traveled across three states before landing in Colorado, the mill is still in fine working order. No planned obsolescence here! Grain poured in the top funnel drops between two vertical stone disks in the center chamber. There, one disk grinding against the other transforms kernel to soft stone-ground flour. Amazingly, even the grinding disks have barely suffered from years of grain grinding. In fact, the mill’s elegantly functional design is still used in grain mills manufactured today–with the exception of a plastic, rather than metal funnel. 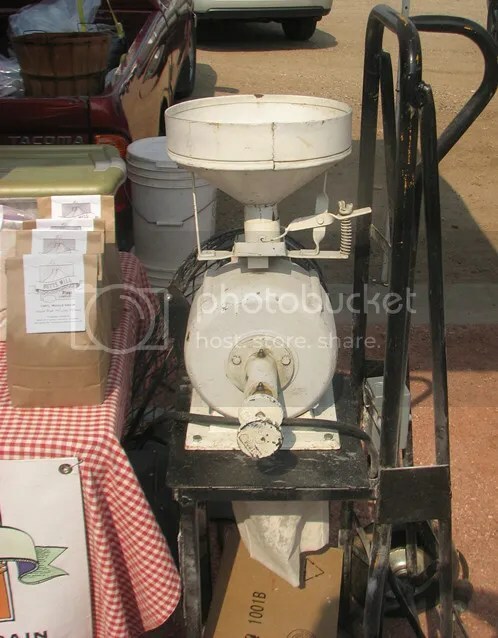 As long as it’s not raining, Farmer John trundles his mill to the Boulder Farmers’ Market each week so shoppers can enjoy freshly ground flour. See our video about the benefits of freshly ground grain. If you can’t make it to the market for Farmer John’s flour but still want the benefits of freshly ground wheat, check out the little Back to Basics mill that has served us well for many years. It’s hand operated–good for a quick boost of the metabolism or an engaging activity for over-energetic kids. 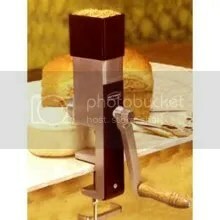 Use the mill for almost any grain and adjust the coarseness for anything from flour to breakfast cereal. You’ll be surprised at how wonderful freshly milled cereal tastes in the morning.